Continuing our review of spiritual gifts, we are reminded that two of these gifts (apostle and prophet) ceased around 95 to 100 A.D. Yet it was primarily through Paul's gift as Apostle that God revealed the Mystery Doctrine. Emphasis is placed on a congregation reaching spiritual maturity, but how is that measured? We learn the steps: understanding, knowledge, and finally wisdom, which is a skillful application of the knowledge we've acquired, which begins and is based upon understanding. The Apostle Paul refers to "the riches of Christ." How do we attain it, and how does it relate to the Mystery of God? In the classic nursery rhyme, there is a line that says, "how does your garden grow?" As we begin to phase out of Paul's introductory section of Colossians, we begin to learn of the imperatives used to guide believers in the basic structure of the Christian life. In this lesson, we learn that order, organization, and self-discipline are keys to a good spiritual "garden". Are you including in your own daily structure reading God's Word, prayer time, and Bible study? If Paul were mentioning twenty-first century believers in his greeting as he was the Colossians, would he be thankful for our own orderly, organized, and self-disciplined spiritual life? The culture of Asia Minor was known for its different philosophies and a tolerance that different religions were accepted within the culture as having equal value. In modern day 21st century society, we experience the same thing. Yet, the Bible clearly teaches that the Gospel of Jesus Christ is a gospel of exclusivity. So how then are Christians to "think", living in such a pagan culture? And is there a secret to the Christian life? In this lesson, we begin to learn more about the 30 imperatives that Paul writes about that are to define the Christian life. The centerpiece of the Epistle of Colossians is in vs. 6-15. The core of that centerpiece is in vs. 6 and 7 - "walk in Him". We learn that this is both positional and experiential. The Greco Roman culture, not unlike our own culture, had no sense of sin. Yet we are again reminded by Paul, who uses the term 164 times, that we are "in Christ." But how do we receive Christ? How do we walk in Him? In this lesson, we learn that our walk experience is how we conduct our life, dependent upon God step by step and moment by moment. There are four keys in vs. 8 to walking in Christ. We are "rooted", we are "built up"; we are "established"; and we are "abounding". Understanding these concepts determines how your spiritual life grows and progresses. How well do you know doctrine? How is your own spiritual life growing? As we continue learning more and more about walking in Christ, we must examine how the meaning of life is defined. Is it determined by what gives us our own personal sense of pleasure? When we suffer, do we get the feeling that God is perhaps withholding from us something good we would otherwise experience? And do we think we know what it takes to solve our own problems? 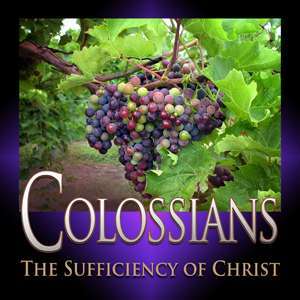 As we grapple with today's worldviews of self-sufficiency, we learn more in this lesson what God's Word means by the word "sufficient."